Spotted this on Abstract Logix: Bassist Jonas Hellborg has a new band featuring guitarist Mattias IA Eklundh and drummer Ranjit Barot. The trio will tour Germany in May in support of their upcoming album Jazz Raj. Dates and locations are below. Abstract Logix has posted an interview with guitarist Mattias IA Eklundh. Mattias' new project with bassist Jonas Hellborg is entitled Art Metal, and will be released Sept 17th. 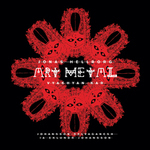 Bassist Jonas Hellborg will release his latest album Art Metal on Sept 18th. This project includes guitarist Mattias IA Eklundh, keyboardist Jens Johansson, drummer Anders Johansson, and Indian percussionist V. Selvaganesh. This mixture of Eastern and Western styles should make for a very interesting album.